COPD which stands for chronic obstructive pulmonary disease refers to a progressive illness which makes it extremely hard for anyone to breathe. It is known as a progressive disease because it can get worse if left untreated for a long time. COPD causes a kind of coughing which produces huge amounts of mucus, tightness in your chest, shortness of breath and wheezing. Among the major causes of COPD are excessive cigarette smoking and long-term exposure to various lung irritants including chemical fumes, dust and air pollution. COPD is also a kind of disease which causes lesser flow of air in and out of your airways due to the loss in elastic quality of your air sacs and airways, destroyed walls between your air sacs, thick and inflamed walls of your airways and clogged airways. Aside from excessive cigarette smoking, COPD is also caused by other factors such as occupational exposure, air pollution, genetics and autoimmune disease. It should also be noted that the symptoms that you will experience if you have COPD will be dependent on the severity of your lung damage. You will know that your case is already too severe if you experience symptoms such as swollen legs, feet or ankles, lower muscle endurance, weight loss, difficulty in talking or catching your breath, lack of mental alertness, rapid heartbeat and bluish or grayish lips or fingernails. Among the most effective treatments for this disease are lifestyle changes, medicines such as bronchodillators and steroids, pulmonary rehabilitation, lung transplant, lung volume reduction surgery and oxygen therapy. If you want to become a certified COPD professional, then it is advisable for you to enroll in the COPD certification program which is now available at Brainmeasures. You can expect the COPD course offered by Brainmeasures to cover all the aspects linked to chronic obstructive pulmonary disease so becoming one of the most renowned experts in this field will no longer become impossible. You can expect the COPD training that you can get from this certification course to provide you with reliable information about all the major causes, signs and symptoms and possible treatments of the disease. You can also expect this COPD certification course to help you understand how the human lungs work. Once you become more familiar about the major functions and workings of the human lungs, you will be able to understand COPD better. 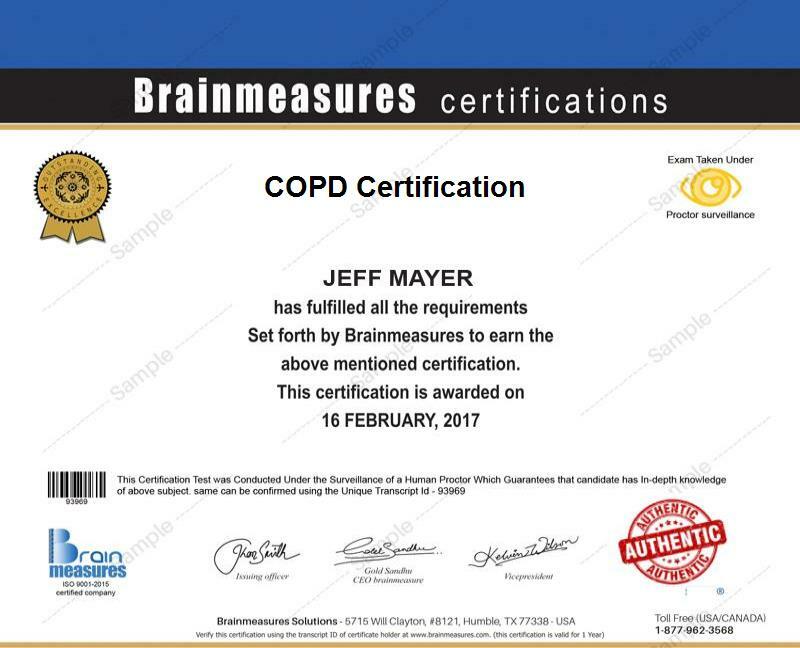 Getting your COPD certificate from Brainmeasures is extremely rewarding because this move will surely raise your confidence when it comes to providing your skills and expertise in dealing with this disease. How to prepare for emergencies in case you are living with people who are suffering from COPD? How to help someone with COPD? Enrolling in a COPD certification course is extremely beneficial for you especially if you have longed to understand all aspects that are related to COPD. The program is perfect for you if you are one of those registered health professionals who wish to develop their skills and expertise when it comes to dealing with COPD patients. Through this certification course, you will become one of the most renowned COPD experts who are capable of accurately diagnosing and treating the disease. Finishing a COPD certification course is also a major help in your attempt to enjoy a significant increase in the level of salary that you regularly receive. You can expect your COPD certification to be very effective when it comes to getting the position of a COPD nurse which is extremely beneficial for you especially if you have longed to receive more than $52,000 annually. You can expect your salary as a COPD nurse to increase even more if you are already an experienced professional and if you work in a more stable healthcare facility.